Quinn Konopacky measures the infrared radiation emanating from Jupiter-sized planets outside of our solar system, which provides a view of their distant atmospheres. 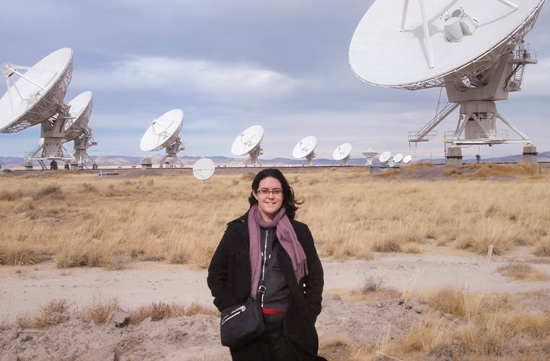 Shelley Wright is leading a search for laser pulses from intelligent life in the universe while developing a crucial instrument that will allow astronomers to see distant stars more clearly on what will become the world’s largest telescope. 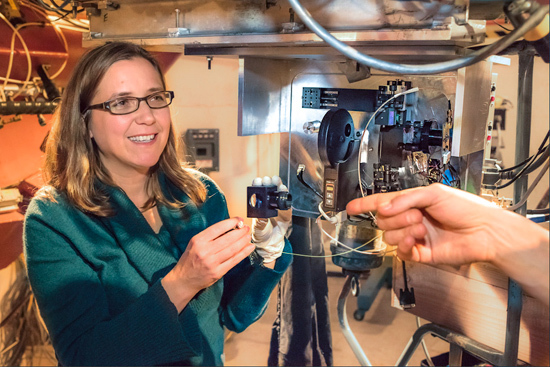 And Karin Sandstrom is studying the diffuse gas and dust between the stars in galaxies, tracking how it evolves over the history of the universe. 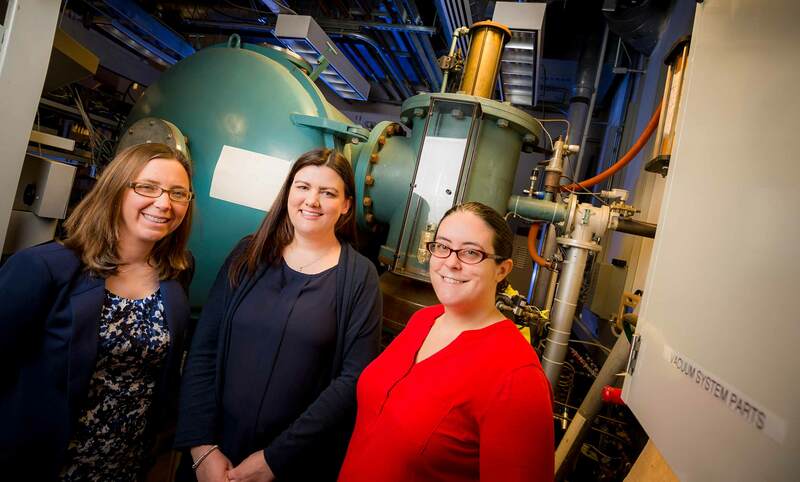 These three women— astrophysicists recently hired as assistant professors of physics in UC San Diego’s Division of Physical Sciences and the Center for Astrophysics and Space Sciences, or CASS—are giving humanity a view of the universe as it’s never been seen before. But their impact goes far beyond their pioneering celestial research on telescopes around the world. On campus, they’ve joined UC San Diego’s four other female physics professors—Alison Coil, Eva-Maria Collins, Olga Dudko and Elizabeth Jenkins—as important mentors and role models for women like themselves hoping to pursue careers in astronomy and physics. Recognizing those benefits, more and more of the nation’s universities are making diversity a top priority in faculty recruitments. But that trend has also heightened competition among the top research institutions for the best candidates. 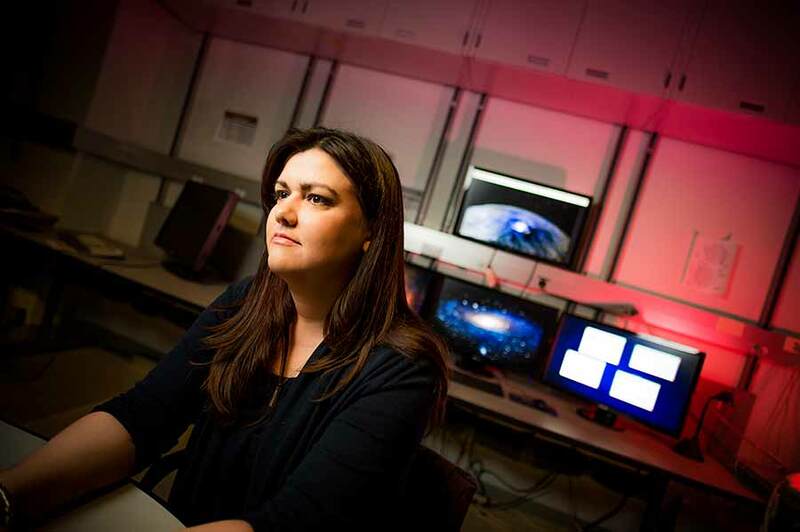 All of which makes UC San Diego’s recruitment of three prominent female early-career astrophysicists a remarkable achievement. During the 2014 academic year, about one-third of the nation’s physics and astronomy departments hired exclusively men, said Susan White, a statistician at the American Institute of Physics, in College Park, Md., who keeps track of annual hiring statistics for astronomy and physics at U.S. universities and colleges. Among the remaining two-thirds of institutions that were successful in adding a female physics or astronomy faculty member, “the vast majority hired one woman, while about 10 percent hired two,” she said. U.C. San Diego’s physics department is not alone in making substantial strides in improving the diversity of its physical science faculty. Last June, Chemical & Engineering News ranked UC San Diego’s chemistry and biochemistry department second in the nation in a survey of professorships held by underrepresented minorities. “Our ability to recruit the best early-career scientists is a testament to the strength of our faculty and research programs,” said Mark Thiemens, dean of the Division of Physical Sciences. But it’s also been helped along by an innovative hiring program in the division to increase faculty diversity in physics, chemistry and mathematics—disciplines long dominated by white males. While the physics department last year was provided funding from the campus to hire one new faculty member, the exceptional background of the three candidates allowed it to argue for a second position through the division’s excellence fund and a third from the UC Office of the President, said Ben Grinstein, chair of the physics department. So what will be the impact for students of the near doubling in one year of the number of female physics professors on campus? Plenty. Grinstein pointed out that the number of female physics majors on the campus has steadily grown, nearly tripling in just the past eight years—from 36 students in 2008 to 101 students in the 2015 fall quarter. That trend, he said, underlines the importance of having visible role models and mentors among the faculty for women hoping to pursue advanced degrees and careers in physics and astronomy. According to the American Institute of Physics, female graduate students and postdocs in those fields are frequently hampered by “the imposter syndrome”—the belief that they don’t really belong in scientific disciplines dominated by men. As a consequence, many women drop out before they can establish their careers as scientists. But effective mentors, particularly other women scientists, have been shown in studies to counteract that problem. At a time when women remain underrepresented in the sciences and a student can still complete a physics degree without taking a class in her major led by a female professor, UC San Diego welcomed nearly 200 students to a conference for undergraduate women in physics this past weekend. "We wanted to provide an opportunity to make connections," said Emily Payne, a fourth-year physics major who led the local organizing committee. "What I mean by that is not so much networking to find jobs, but to create a community." Along with Alison Coil, an associate professor of physics who has long taken the leadership on campus in promoting opportunities for women in astronomy and physics, the three new assistant professors have been working with students to help plan a three-day regional Conference for Undergraduate Women in Physics, which took place on the campus last weekend. Sandstrom is mentoring an undergraduate physics major, Bethany Ludwig, on a project studying the dust from a supernova remnant and is overseeing the work of a graduate student from Bulgaria, Petia Yanchulova Merica-Jones, examining the glowing dust from images taken by the Hubble Space Telescope. Konopacky is working with Debbie Tran, a physics major specializing in astrophysics, who has been helping her analyze data from the Gemini Planet Imager, the instrument in Chile and Hawaii from which they are able to obtain detailed information in the infrared about the atmospheres of Jupiter-like planets outside of our solar system. “Debbie has made a huge amount of progress in a very short time and the work that she's done has already been incorporated into papers by a number of different people in our collaboration,” said Konopacky. Fuller said he hopes the increased interest in physics and astronomy among women on the campus—and the corresponding increase in women faculty mentors this year—will translate into more females entering careers in physics and astronomy because the opportunities for research have expanded. Fuller noted that the physics faculty takes special pride in the fact that UC San Diego was one of the first universities to actively recruit the best women physicists and astronomers in the world—at a time when other universities wouldn’t hire them as full-time faculty members or would otherwise put restrictions on their employment. “UC San Diego was a pioneer in that regard,” he said. Before Maria and Joseph Mayer were recruited to the campus in 1960 from the University of Chicago, for example, it was Joseph, not Maria, who had a faculty position. “Maria only had a desk there,” Fuller said. “UC San Diego gave Maria Mayer her first faculty job.” In 1963, as a professor of physics here, Mayer won the Nobel Prize in Physics for proposing the nuclear shell model of the atomic nucleus. Two years after Maria Mayer’s arrival, in 1962, Margaret Burbidge and her husband Geoffrey were recruited from the University of Chicago as professors. But in order to avoid the anti-nepotism hiring rules at the time, the campus found a way to hire Margaret as a chemistry professor because Geoffrey’s appointment was in physics. Margaret was eventually given a professorship in physics, served as the first director of CASS from 1979 to 1988 and was awarded the National Medal of Science in 1983. The late Sally Ride, the first American woman in space, was appointed a professor of physics in 1989 on the campus as well as director of the California Space Institute. She was an emeritus professor of physics at UC San Diego until her death in 2012. In recent decades, Fuller lamented that the university hadn’t been able to build on its longstanding tradition of breaking the glass ceiling for outstanding women physicists by providing more faculty positions to women. But he’s clearly thrilled that in one year, in one fell swoop, the pendulum has swung back again. “We’re a world leader again,” said Fuller proudly.